Toasting marshmallows or wrapping some spuds in foil and pushing them into the coals is about as creative and daring as a lot of us are willing to be when it comes to open fire cooking, as the risk of turning that precious piece of prime steak into charcoal is just too great. But there is something amazing about cooking on an open fire. 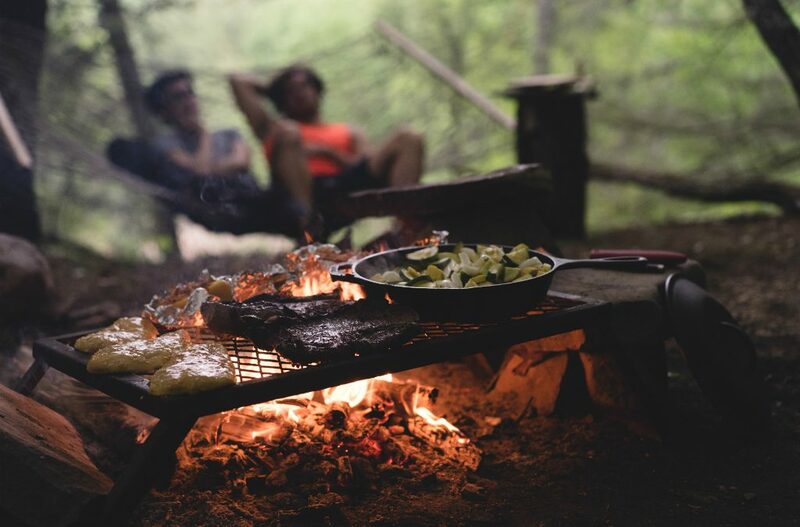 The smells and flavours are different, the experience is more ‘back to nature’ and the end result more satisfying when you build your own fire, work at keeping it alive and finish with a beautifully cooked meal among good company in the great outdoors. The history of barbecue is founded in the flames of the open fire. Spanish explorers in the Caribbean discovered natives using an early-style grill consisting of criss-crossed green saplings to cook their meat over fire. The native word for this technique ‘barbacoa’ was adopted by the Spanish and over time (and many mis-pronunciations and spelling errors) evolved into our modern day barbecue. In fact, humankind has been cooking on open flames since the Stone Age when early hunter-gatherers discovered techniques of cooking and smoking, the earliest of which involved simply suspending an animal over an open fire or burying it in the coals. Of course we have come a long way since then and the convenience, popularity and ease of our modern day barbecue means that most of us have the opportunity to cook at home or outdoors with relative ease. But in this article we want to take you back to basics and, with the advice of French chef and avid camper Greg Ecard from The Watermark Townsville, give you the best advice on cooking your steak on an open fire. There is plenty of information around detailing how to create your own campfire, and if you have never done it before then it is best to learn from someone who knows or to do your research first. Keep in mind that the wood you use will affect the flavour of your food and hardwood is the best option to create red, hot coals. It is essential that the wood is dry as wood holding any moisture will smoke and the coals will not burn hot enough. >The biggest challenge when cooking on an open fire can be maintaining the right temperature (and an even temperature) and flare ups. Some parts of your grill may be hotter than others so if needed, move the steak around the grill plate to ensure an even cook. If flare ups do occur (caused by fat dripping on to hot coals), move the steak to another part of the grill until the flames subside as they can char the surface of the steak. Greg’s advice for the best cut of meat to cook over an open fire is a thick piece of rib eye fillet on the bone. “The fat content of this cut is ideal for campfire cooking. Marbling provides some insurance against overcooking, which is ideal,” he says. Some may prefer simply to cut into their meat to check its progress, however Ecard always uses a meat thermometer. “The end result will always be spot on if using a steak thermometer,” he says. Keep a close eye on the doneness of your steak and turn when necessary. Make sure you don’t burn one side of your steak to a char over the open flames. You can refer to the below table to get your steak’s temperature and doneness spot on. The best thing, Greg says, is to start cooking and over time you will gradually learn your own lessons and techniques when cooking on an open fire.